Lock in a great price for La Iguana Perdida – rated 8.7 by recent guests! The group meals and the layout of the space and the overall vibe... plus the views. i loved the private loft i had it was so comfy and unique and beautiful. the bed was great, the design was great, i really felt like i had a little private escape. thanks again! Loved the terace, the dinner and all the activities they plan almost every night. Best place to relax by the lake, even have fun and party a bit if you feel like. 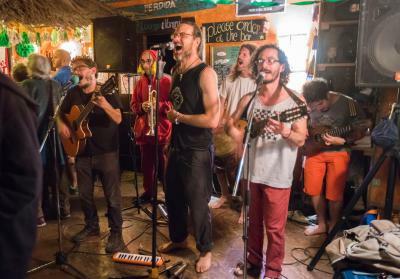 The people make the Lost Iguana so fun - both the fantastic staff and the travelers going through. 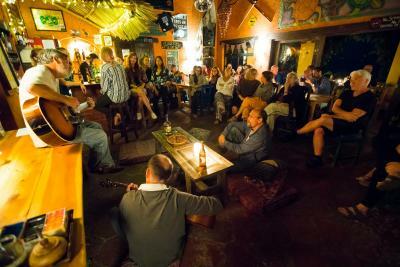 It has a great friendly social vibe and the Saturday night dress up party is not to be missed! I was worried about being "stuck" in Santa Cruz because there is not much there but it was really fun (and it was not loud late at night). 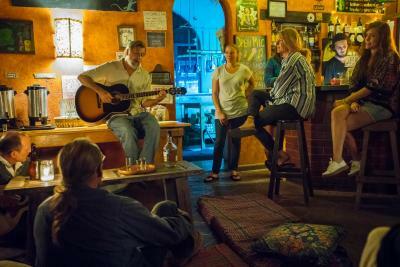 I also appreciated the diversity in ages of the guests -- it's not all 20-somethings looking to party (vs. Free Cerveza). I loved being right on the lake and able to walk right from the hostel on safe trails to other nearby places for daytime and other dinners and even found a dock where I did my own sunset yoga. I was sad to leave! I loved the place and staff. I felt very safe comfortable. Thank you to everyone. Excellent location. Very relaxing environment. Staff are incredible, very attentive to your needs, beyond friendly and helpful. Wish I could have stayed longer. I’m definitely going back. Location is right on the water which is perfect. Staff are super nice and helpful with loads of activities bookable from them, good facilities, love the hammocks and cool jungle kind of vibe throughout the place. Very social, but not a party hostel. Best hostel I ever stayed at! 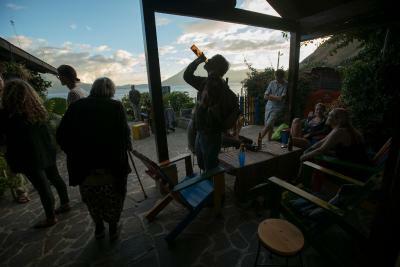 The volunteers are amazing, and try everything to make your stay unforgettable. I loved the family dinner, they even cooked a portion extra for me, because of my allergies. I booked a weaving class at the hostel, which I can highly recommend (the local girl gets 100% of the money!). I slept at castillo, which is the cheapest dorm, and i didn't know before, that this hut is open. So it gehts very chilly at night, but at least the air is very very fresh, and of you sleep in Bed 3 the sun wakes you up in the morning :D! La Iguana Perdida This rating is a reflection of how the property compares to the industry standard when it comes to price, facilities and services available. It's based on a self-evaluation by the property. Use this rating to help choose your stay! 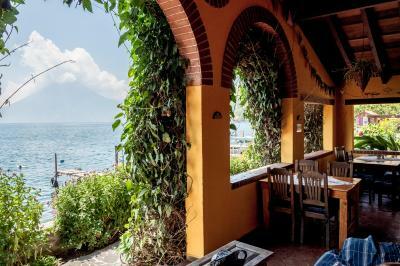 Offering a restaurant, La Iguana Perdida is located in Santa Cruz La Laguna, right on Lake Atitlan, Guatemala. The property is surrounded by tropical gardens and can arrange on-site activities like hiking and diving. The rooms here are spacious and include a seating area and a shared or private bathroom with a shower and toilet. Dormitory rooms are also available. 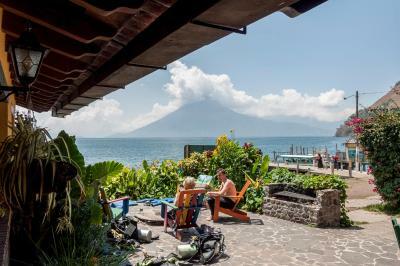 Guests at La Laguna Perdida enjoy an on-site bar, and other options can be found in the neighboring town of Panajachel, a 15-minute boat ride from the property. Guatemala International Airport can be reached in a 3-hour drive. This property also has one of the top-rated locations in Santa Cruz La Laguna! Guests are happier about it compared to other properties in the area. This property is also rated for the best value in Santa Cruz La Laguna! Guests are getting more for their money when compared to other properties in this city. When would you like to stay at La Iguana Perdida? 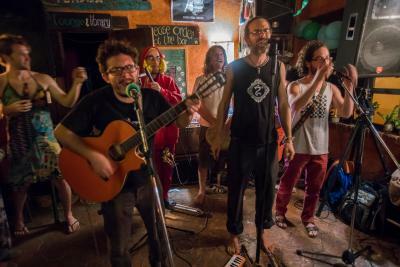 House Rules La Iguana Perdida takes special requests – add in the next step! La Iguana Perdida accepts these cards and reserves the right to temporarily hold an amount prior to arrival. Please inform La Iguana Perdida of your expected arrival time in advance. You can use the Special Requests box when booking, or contact the property directly using the contact details in your confirmation. The staff at times could be a bit ignorant of certain things, being that a lot of them were volunteers working there for a month at a time, mostly younger adults from Europe or America. Our drinks were made weirdly or incorrectly only a couple of times. We asked for extra pillows and another towel and never received them. The two mattresses in the room were different for some reason, once being dense and a bit worn in and one that was lumpy and had old springs. We fell asleep quickly though because of all the adventures we had during the day. The pillows are tiny and I had to use the extra blanket to prop it up. The bathrooms were open-air so sometimes you could feel like people were looking in (they weren't). There was no wifi but we had a decent cell connection (T-Mobile) so we could still contact people. Most days the tuk-tuks going along the street next to the hotel drowned out any pleasant noises from the water. The boats could also be loud and there were men doing construction to the docks area when we were staying there. I just put in headphones and listened to music to drown it out, but it definitely made it feel less secluded than other places would feel. My sister and I stayed in the budget twin room, Payaso 2, for a week in March 2019. The staff all speak english. This hotel made our first experience on our own feel like a safe, fun adventure! Room accommodations: Bathrooms are straight across from the room. The room is beneath the bungalow and next to another private room. There is no A/C but this wasn't a problem because we would just crack the windows and let the cool night air drift in when the sun went down. There is a lock with a chain on it outside of the door that you lock when you're away, and then a sliding lock inside the room. There are two sets of American-issue outlets. Extra blankets and towels are provided. The bathrooms were pretty standard for the area (see pictures attached). I got a warm shower a few times and a truly hot shower just once but it felt great! I used filtered water to brush my teeth to be safe. Common Area: We spent a lot of time here, just sitting and reading, listening to music, petting the cat/dogs, and watching the sunrise. There are three hammocks, a few tables with chairs, and a ladder that leads up to raised platform with more chairs (this was our sunbathing spot). Around the restaurant there are small groups of tables and chairs, cafe-style, with beautiful flowers and views of the lake. The TV room has bongos, two guitars, movies, board games, and cards. There is a beautiful trail- 30 min walk-to the next village just down the shoreline as well. Bar/Restaurant: They serve food all day but for dinner you have to sign up by 3 so they make enough food. I recommend the french toast for breakfast with the avocado smoothie. Around the hotel along the lake there are other places to eat but they also do the "sign-up" dinner thing, so I would just stick to the hotel most nights. They have free filtered water to drink, along with hot water or coffee for purchase. Every meal was delicious and filled us up. Be aware that the extremely low price is basically a misnomer, you have to pay for everything here. 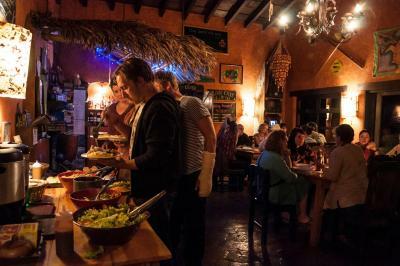 No breakfast or food or even coffee included, and due to the nature of Santa Cruz you basically have no choice of eating anywhere else but the hostel's options, especially for dinner. Everywhere within walking distance of the hostel (and there's not much) requires a reservation, and the hostel does too. I was in the 8 dorm beds and mine was in a little corner so I felt a bit oppressed. Then I changed for the bed under the roof, it was beautiful, I felt I was living in the trees. The only negative point is that the mattress wasn’t comfy. Rather than that it was lovely to stay there. The view and the common area amazing. The staff is very helpful and give a lot of advice. A kitchen and this hostel would be perfect. Perfect location right in front of the lake and the lancha dock, beautiful cottages surrounded by green, pretty good food. Yoga lessons in the morning and chatting replacing wifi were the 2 icings on the cake! Other guests seemed to stick to their own demographic. The view from the common area was beautiful. We enjoyed the variety of seating areas. The bonfire at night was a nice touch. The town up the hill was great to visit (and a bonus workout). Absolutely the best place to stay at the lake. 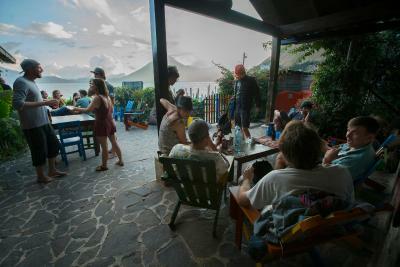 The hostel is beautiful, with a lot hammocks and comfortable chairs to relax and enjoy the view on the lake. The staff is excellent, they make you feel home from the moment you arrive till you leave. 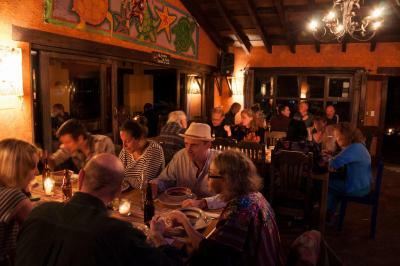 You can join dinner every night, which is cooked by local women. In Santa Cruz is nothing to do, but at the same time there’s a lot to do. Hiking on volcano San Pedro, kayaking, SUP — whatever you like. The boats leave every 20 minutes in front of the hostel, so it’s easy to go to the other villages around the lake. The rooms are clean and the beds are really comfortable. Again: absolutely the best place to stay at the lake. Everybody I met stayed longer than they planned, and so did I.